I am on Ubuntu12.10 Quantal 64bit with apport2.2.2-0ubuntu2. Cannot connect to crash database, please check your Internet connection. slice indices must be integers or None or have an __index__ method"
The internet connection is valid. I have tested to report it with manually calls several times and during I am writing this here. I attach the .crash file which is affected. I have retested it some minutes ago. Now it works. Seems to be that it was a problem with the db/launchpad and not with apport. 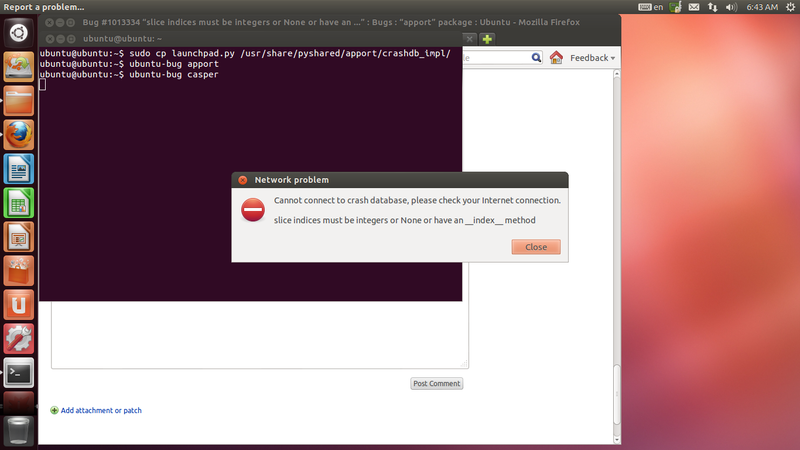 This is happening to me for apport_2.2.5-0ubuntu1, the up to date version for today. 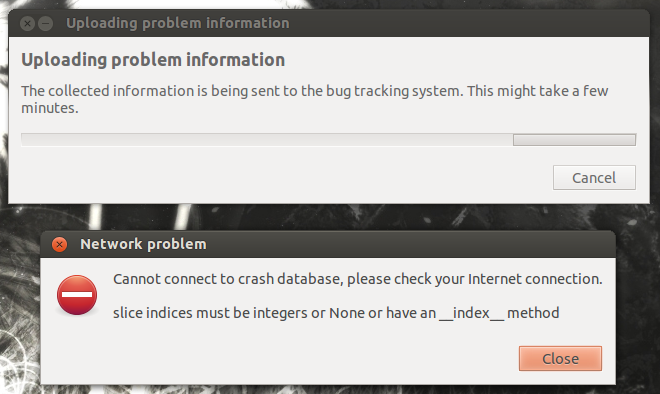 I can confirm apport_2.0.1-0ubuntu5 from precise doesn't contain this problem. Thanks! This is indeed not a networ error at all. I fixed apport's trunk to crash properly on this error instead of claiming it to be a network error. Unfortunately I cannot reproduce the actual issue with your attached .crash file. Can you reproduce the error at will? If so, I'd like to hand you a test package which should give me more information about this problem. It apparently crashes somewhere in launchpad.py's upload(). But I went through all slices in launchpad.py, and none looks prone to invalid indexes, so right now I don't have a good guess what goes wrong. Presumably it's not directly in launchpad.py, but in giving bad data to the email module. then do the steps which previously caused this error? Apport should now actually crash and leave behind a .crash file. I still had my Ubuntu i386 20120626.1 disc laying here that I'd first seen this error with as reported in dup bug 1018032 so I booted it, DLed the requested file to /home, then ran the requested command. Next I tried running ubuntu-bug apport which failed to reproduce this bug (but I filed bug 1018803 just to see what happened). I looked in /var/crash but it's empty, and I don't see it anywhere I look in /var/log or in /homes hidden dots. Sorry for my ineptitude. At least I do know how to reproduce the error easily with that older iso. Just came in to take a break and decided to try Ubuntu live i386 20120627 (presumably Alpha 2) to see if the above could be reproduced and it can be. Just boot to the live desktop, open the terminal, and then run "ubuntu-bug casper". I'm sure it can be reproduced with other methods, particularly with some of Lubuntu's ubiquity problems, but hopefully that info will help. I'll be glad to test anything recommended, just remember I'm an end user with almost no technical knowledge. I tried this on the 20120627 i386 and amd64 Ubuntu live system (I think that's exactly the same image as you did), in kvm. First right after booting into the live desktop, and a second time after "sudo apt-get update". I also tried it on my workstation (current Quantal amd64). In each of those I ran "ubuntu-bug casper", and clicked Send; I got the upload progress dialog, and was sent to Firefox. In no case did I get that error message. By the looks of your screenshot you are also using some virtual machine like KVM, or using Ethernet? So I'm puzzled now what could be different. The main thing that comes to my mind is: Are you using a proxy on your host machine (i. e. not in the live system guest)? and then reproduce the situation again? If you then get an apport crash file in /var/crash/, please attach it. If you see any output from that ubuntu-bug command in the terminal, please copy&paste it here. The tests I performed in both comment #11 and #12 were done using a live CD, not an installed version of Ubuntu. But I'd seen this in Lubuntu after installation, presumably due to a grub-install error during installation. I will attach the xsane.crash file from this reproducing. Your are correct, I use VirtualBox4.1.18 from Felix Greyers repositorie for runnign Quantal on a Precise platform(64bit). Additional in moment I could not upload with success any crashreport. So, the problem is not limited to the xsane crash I have attached here. Connecting to people.canonical.com (people.canonical.com)|91.189.89.62|:80... connected. No luck finding the .crash file, probably due to my own ineptitude. I do always check the md5sum and the disc integrity. I'll repeat this on a different box to see if I get the same behavior. With the updates from today(no apport ones, but many other) apport has got some functionality back. It can connect to launchpad in general now on my system. Still cant report a crash on quantal i386 if i select "report this error"
so maybe those are giving that "slice indices must be integers or None or have an __index__ method"
Thanks for the updated traces! This was indeed very helpful. This apparently happens if the data upload is either very slow, or gets interrupted due to network hangs. I believe I fixed this now in trunk. differently from Python 2's; in Python 2, 1024/2 was an integer "512"
"512.0" which is not a valid array index. - Fix PEP-8 violations picked up by latest pep8 checker. likely to be a network error. - packaging-apt-dpkg.py: Fix get_source_tree() to work with apt sandboxes. works with the current sandboxing. - launchpad.py: Ensure that upload chunk size does not underrun. the application ends before the "is progress bar visible" check is done.